It’s 3a.m and I’m still playing Bloodborne with two other friends on co-op, of course. We shared our individual horror stories of how we’ve either lost what’s precious to us or our manner of defeat in the game, bonded over our unified fear of the dark nights and the terror that lurks ahead in every corner of our surrounding. It was during our discussion that it dawned on me, with the three of us together in this world, I’m not just another feeble hunter waiting for my death on a conveyor belt. No Sir, what was once the meek sheep of the herd I’ve become the wolf in sheep’s clothing. I promise I’ll explain the picture near the end. Co-Op is exciting, fun and generally awesome. The ability to play with a friend and work towards a common goal against the world is a great idea. It allows a platform to encourage communication, build on teamwork and strengthen your friendship together. Lately for me though it has also revealed a portal to a darker side. I never was the malicious type in games nor did I turn my back to those who needed my help or dabble in the forbidden arts (lies… never play monopoly with this guy! Never have I been able to trust him since -editor-san). Games rewarded you if you helped out an NPC with a quest, you couldn’t progress further in the narrative till you defeated the evil beast that dwells in the forest. Everything at the time was geared towards the one outcome, one destination and one theme. Good always triumphs over evil were the stories I was told and I aspired to. Today, the stories are still more or less the same, what changed? Well I grew up. Though more importantly, other players. Games like Fable, Baldur’s Gate, Dragon Age, Witcher and even Final Fantasy to an extent, I was always on the good side. Find a stolen item and return it to the rightful owner, spare the beggar a few coins, help an adventurer in his search for the missing treasure. Sure these games actually offer tangible benefits to you in-game had you follow a more wrathful path but I would have then suffered on the inside in-real life. Slay the thief to profit from both parties, kick the beggar whilst he’s down and rob him blind or even betray the adventurer at the very end to reap all the rewards. I couldn’t do them then and I still can’t bring myself to commit those deeds now. What was required was another outlet of despair, not the soulless piece of machinery that enables me to play in a virtual world; I needed another being of human flesh and mind, something that shares a similar intricate psychology to me, something that I can watch from afar in glee. Welcome Player 2 to my world. It started innocently with Borderlands 2, I became a siren, and he went the path of an assassin. My partner would focus on melee; I preferred dominion over the elements. We worked in tandem beautifully, enemies would fall left, right and centre and we would stand tall against all odds. I discovered the ability to convert the weak willed and have them fight our cause. My partner gained a skill to allow him regenerate lost health through melee attacks. We became a deadly force till suddenly we discovered a mechanic which screwed my partner over. He couldn’t damage allies, even the ones I converted for a brief moments. It was akin to discovering that the down stair kitchen tap can affect the water temperature in the up stair shower. We both knew it and understood our situation but he couldn’t stop me from turning the cold water on. Every time my partner would go for the kill, or melee to regain his health *POP* that foe has now become my puppet. He would exclaim his annoyance with me as he died in the fiery combat, I replied with a half hearted sorry. What was once my partner became my pawn, in his perspective I use to be his partner, now an agent of chaos. Fast forward to Bloodborne, we were excavating a chalice dungeon, in an area I have explored already knowing a trap lying ahead. It was beautiful, you couldn’t see the trap as it was hiding off screen, it would only trigger if a player was near it and it would deal massive damage to you. This heaping pile of scum and bones was waiting for my friend on the roof of the tunnel and all I had to do was lead him there. We clear the room, inspected for loot and I suggested we use this tunnel to further our travels. The fool runs through the entrance and then screams, as this creature that heavily resembles a R-18 Muk latches onto his characters model and consumes his flesh and soul. Laughter like this couldn’t come any sweeter. I’ve had my fair shares of backstabs and treachery from close allies. It was only then I recognized that I had lost all sense of chivalry and nobility in games with friends. Bloodborne is a notoriously punishing game as it is and my friend doesn’t need me griefing him on top. Sure I could have argued that if I wasn’t present he would have still died to the very same trap but that wasn’t the point. I neglected my duty in jolly cooperation and embraced the dark side. Whilst Co-Op has now offered me a new platform of enjoyment, it has also supports the sloth in me. Yes, let us combine our skills and expertise in order to overcome the obstacles presented to us. This key is placed far too high for us individually; let us combine our heights like some weird transformation mech to reach it! This group of enemies ahead is much too difficult for me to tackle alone, together though we can slay them. Great concept, who would have thought that being with other people... is fantastic? Happiness incarnate when people achieve something together. Sadly now I’ve notice that in some games, I don’t do my share of the work. FIFA is one of my favourite games to play, especially in a mode called Pro Clubs. We can only control one player each in a match and one person is delegated as “Any” meaning he has to play as the rest of the team which aren’t taken up by another player. Recently we’ve had a strong surge of form and success has been achieved in the form on 8 wins in a row accompanied with a division title. Funny thing is, for some reason I’m terrible in comparison to my friends ability at the game (evidence of a 3-0 loss to him in a friendly match, though I still blame FIFA) Our club success is mainly due to him a lot of the times playing as any, I just pretend to be a useful asset to him and run around on the pitch. We probably could be in division 1 (the highest) but we’ve struggled to maintain a position in division 2-3 due to me I reckon. When we’re on a bad run of games, due to something we call “FIFA aids” in which the game become profoundly unfair to you for no reason and it’s impossible to play because it cripples your team’s ability to play football. I feel useless, I’m dead weight to the team and my contribution is a few runs up and down the pitch with a healthy side dish of screaming “REF!! !” followed by multiple swear words. When the team actually does well, depending on the alignment of the stars and the spirits of the forest, I still hit the crossbar as if it was my job or blaze my shot over in an attempt to bring down a plane, yet I am allowed to bathe in the same success, because it suddenly becomes our achievement through his hard work. I’ll adamantly refuse to admit I’m bad because I’m not but I do notice how the achievement the club has gained is not built on any of my contribution. This phenomenal occurs also occurs in Bloodborne. Especially during boss fights as we tackle them one by one. After every boss fight, we have a huge sigh of relief and chat about our emotions during the fight. Each person has a moment to share their thoughts on the boss with their tactics and problems. It falls down to me as last person left to tell my tale of the encounter. I laugh. “All I did was run behind him and push R2” the only response I got was “wow”. Wow indeed. R2 in Bloodborne is generally an extremely slow but powerful attack. It leaves you vulnerable to get damaged/countered very easily and is generally considered not a sound strategy to constantly use within these sorts of games. My comrades are juggling aggro, healing and focused on strategically taking on the boss and I prance into the scene just slowly charging up my attack, 60% of the time, works everytime. We discover that this game has become so much easier with the Powerpuff Girls (At time of writing, I’ve dubbed this trifecta as that, they don’t know), and we now rinse and repeat this tactic for every situation in the game. We don’t even attempt to judge and analyse any new situation, we all go in single file one by one all doing our power attack. 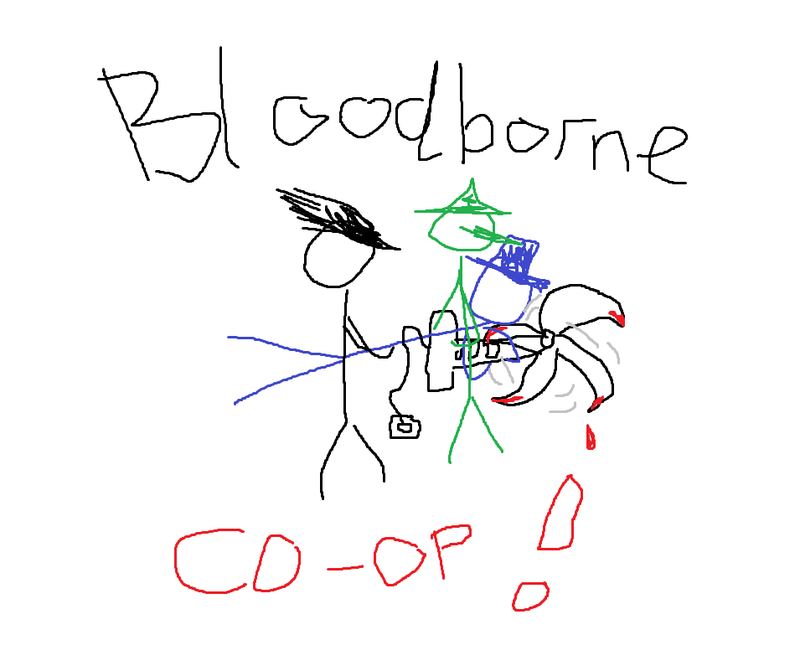 I now can’t play Bloodborne on my own thanks to Co-Op, like clingy children to their parents; I don’t want to go through the horror known as Bloodborne without my squad. See? Told you the picture was relevant!